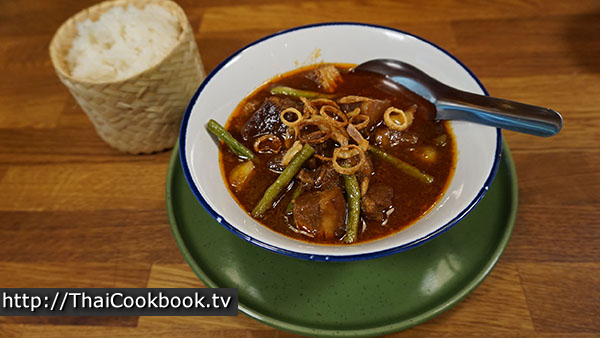 Kaeng Hunglay is a northern Thailand-style curried stew, usually made with pork belly or other fatty pork meat. The recipe varies widely from cook to cook, and from province to province, with each having its own special ingredient that makes it unique. The ingredient list usually includes whole garlic cloves, julienne slivers of fresh ginger, and sometimes green beans or even pineapple. The one ingredient that is always added is Garam Masala, an aromatic blend of spices found in Indian and Burmese cuisine. This all-purpose seasoning adds the warm, sweet flavors of toasted coriander, black pepper, cumin, cardamom, and cinnamon. Kaeng Hunglay is quite different from the widely known sweet coconut curries of traditional Thai cuisine. 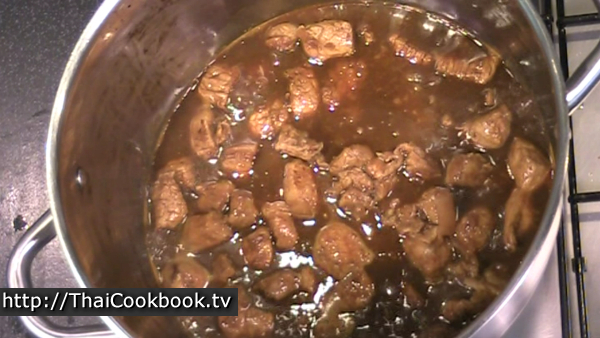 It is more like a rich and hearty meat stew that has a mildly spicy sweet and sour flavor. 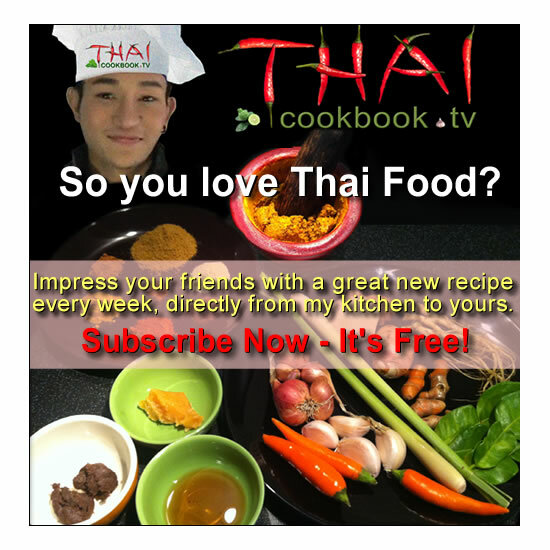 The dish is easy to make, but does require a long cooking time. You can do it in several parts and break up the work over a few days to make enjoying it easier. The stew will keep well in your refrigerator and can be heated up just before serving. What's in our Northern Thai Burmese Curry. How we make our Northern Thai Burmese Curry. 1) Make a chili paste by grinding together dried chilies, galangal, lemongrass, shallots, shrimp paste, and salt. 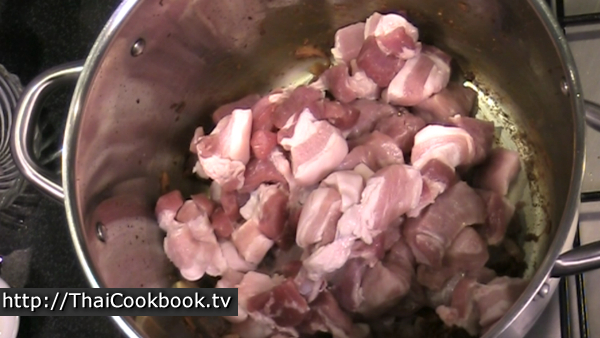 2) Lightly fry the chili paste in oil, then add pork belly, pork shoulder, along with seasonings and sauces. Add water and boil for an hour. 3) Add julienne cut ginger and pickled garlic cloves. Cook for another 30 minutes. 4) Add cut green beans. Cook for 5 minutes, then serve. Top with crispy fried shallots and serve with sticky rice. The seasoning chili paste (curry paste) for Kaeng Hunglay is made with both fresh herbs and dried spices. 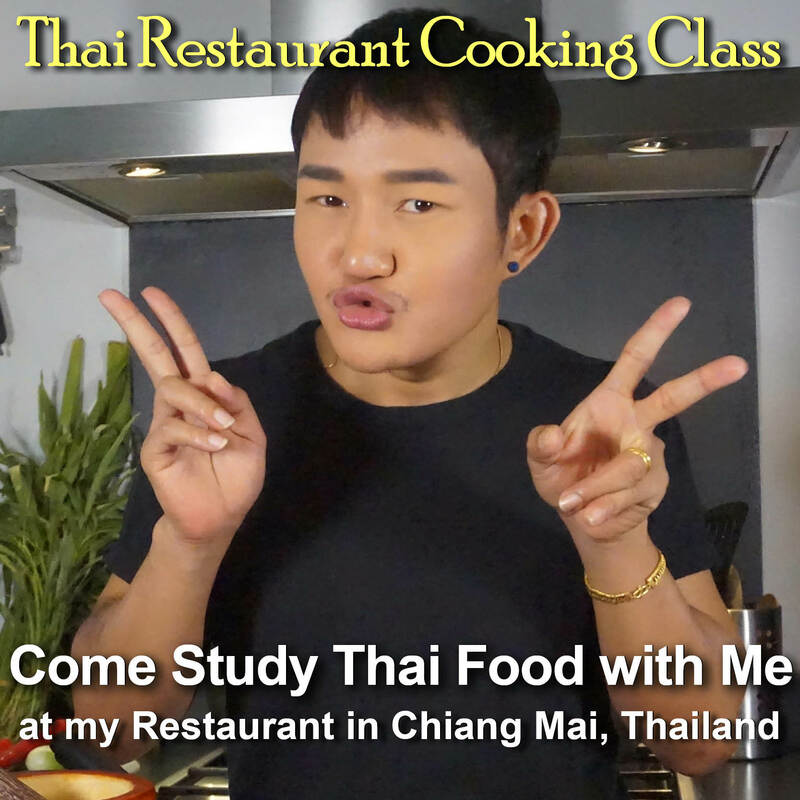 In this recipe we'll use a simple herb paste of chili pepper, galangal, shallot, lemongrass, shrimp paste, and salt. We'll get the spice flavors from a packaged blend of Indian curry powder known as garam masala, which contains coriander seed, black pepper, cumin, cardamom, turmeric, cinnamon, nutmeg, and clove. The exact ratios of each will vary quite a bit. 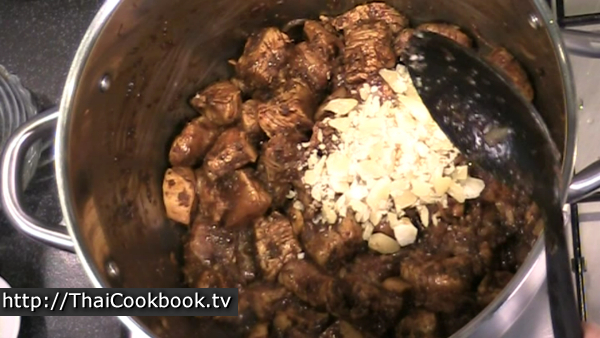 Mix this well, then measure out the 2 tsp of the blend to use in this recipe. You will have some left over for next time. Soak the dried Long chilies in warm water for about 30 minutes, then use some scissors to cut them open and remove the seeds. You want to use only the red parts on the outside. Slice the bottom portion of the lemongrass, slice the shallots, and grate or chop the galangal very fine. Grinding: Start with the soaked, chopped, and cleaned chilies, together with the salt. Grind them until you have a soft mush. Next add the other ingredients one by one, grinding each into the mix until the paste is smooth and without any large pieces. I add lemongrass to the chilies, then the shallots, then the galangal. 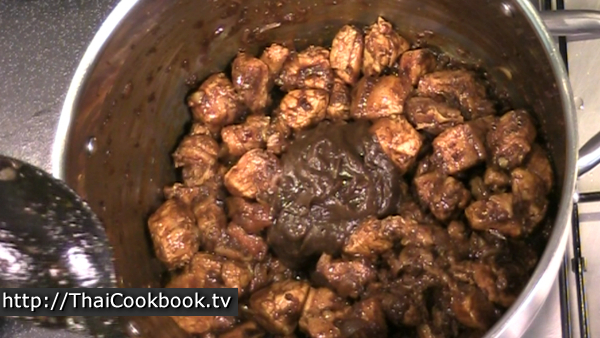 Once it is smooth, then add the shrimp paste and blend well. This is the herbal portion of a kaeng hunglay chili paste. We'll add the spices when cooking the stew. You can refrigerate this for up to a week if you want to do this in advance to save time when cooking the meal. 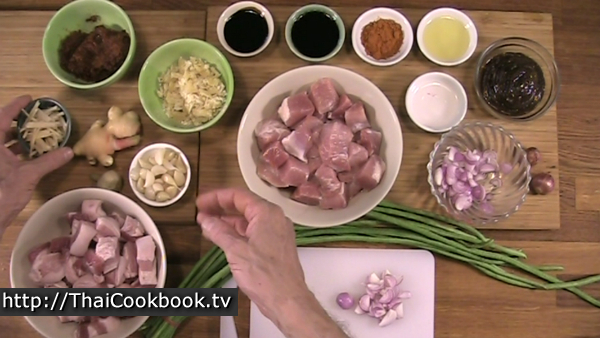 Cooking the Kaeng Hunglay is quite easy once you have all these ingredients organized. Cut the pork belly and pork shoulder into 1 inch cubes. Julienne about 2 tablespoons of fresh ginger. Separate the pickled garlic cloves, if needed, and peel the shells. Peel and slice the shallots, and measure the other ingredients. Heat the oil in a large pot over low flame so it's just warm. Add the chili paste and fry it lightly for about 2 minutes, watching the heat so it doesn't scorch. Add the sliced shallots and fry with paste until softened. If the mix is very dry and clumpy, you can add one or two tablespoons of water and stir well until smooth. Add the meats and stir it around until well coated in the spices. Keep the heat low, as you are not trying to fry the meat, just heat it up. Add the dark soy sauce, fish sauce, and vinegar. Stir it all up well. Add the coconut sugar and stir in until melted. The mix may start to bubble now, but still keep the heat low. Now sir in the tamarind paste. Add just enough water to cover the meat, about 2 cups. Stir it all up very well. Turn up the heat until the pot is boiling well, then turn it down so it is simmering slowly. Cover the pot and simmer like that for about an hour. You can check it, stir, and add water as needed to keep a little broth. It should not be dry and thick. After simmering covered for an hour, add the julienne ginger and the pickled garlic cloves. Stir in well and continue simmering with the lid off for about 30 minutes to let the sauce thicken. But you may need to add a little water to keep it from getting too thick. Now the stew is done, except for the green beans. You can let it get cold, refrigerate for up to 3 - 4 days, however you like. 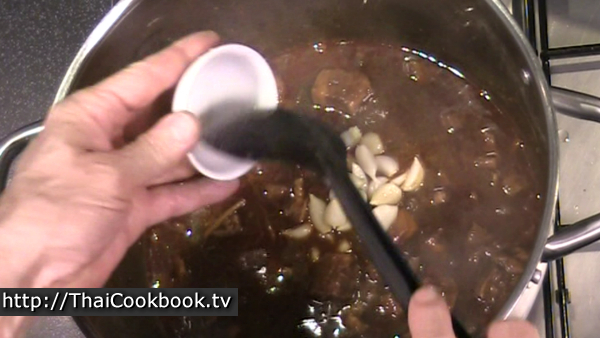 The stew will have a lot more flavor if cooked the day before, and it really make enjoying your dinner a lot easier. 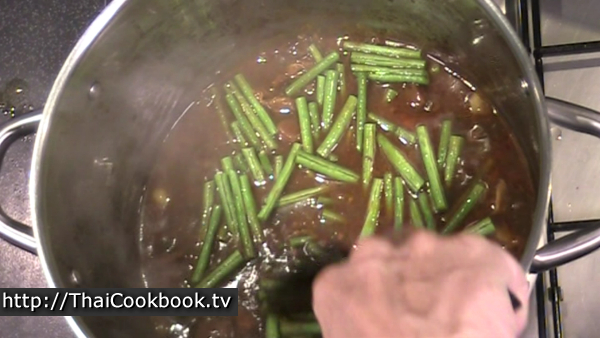 The green beans should be added and cooked for just 5 minutes right before serving. 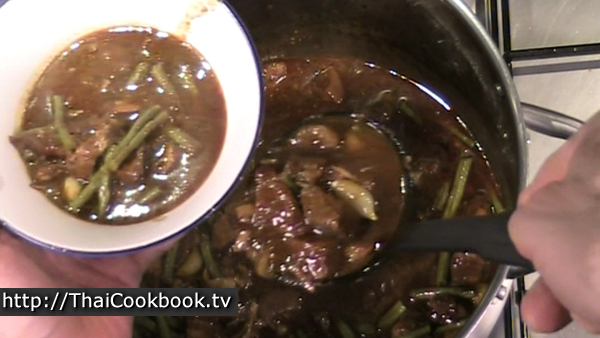 When ready to serve the stew, reheat gently until very hot and bubbly, then add the cut green beans. Turn off the heat and let the pot cool down for about 15 minutes before serving. 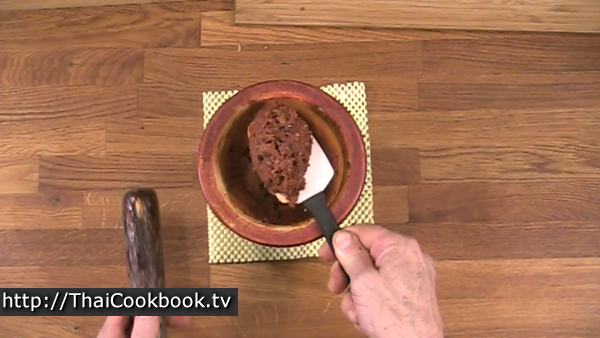 Serve in individual bowls or leave it in the pot to serve at the table.